In the U.S. and across the globe, shipyards create solid, long-term economic stability in their regions. Ship construction and repair requires an extraordinary amount of expertise, time and resources. This work is made even more challenging because current economic pressures drive companies to reduce costs wherever possible without hindering production or quality. Having multiple shipyards in a region creates a naturally interdependent, yet highly competitive culture. This is because the industry shares a geographically close environment and has to rely on shared resources to protect common interests even while competing for projects. 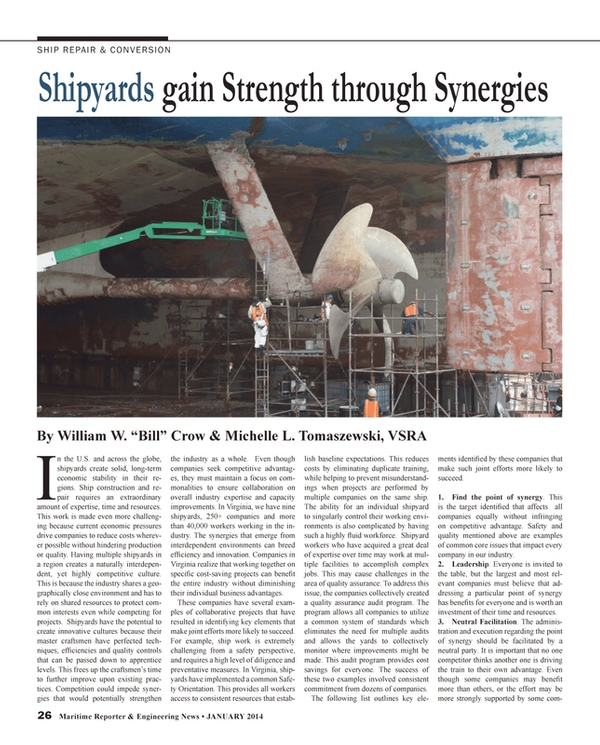 Shipyards have the potential to create innovative cultures because their master craftsmen have perfected techniques, efficiencies and quality controls that can be passed down to apprentice levels. This frees up the craftsmen’s time to further improve upon existing practices. Competition could impede synergies that would potentially strengthen the industry as a whole. Even though companies seek competitive advantages, they must maintain a focus on commonalities to ensure collaboration on overall industry expertise and capacity improvements. In Virginia, we have nine shipyards, 250+ companies and more than 40,000 workers working in the industry. The synergies that emerge from interdependent environments can breed efficiency and innovation. Companies in Virginia realize that working together on specific cost-saving projects can benefit the entire industry without diminishing their individual business advantages. These companies have several examples of collaborative projects that have resulted in identifying key elements that make joint efforts more likely to succeed. For example, ship work is extremely challenging from a safety perspective, and requires a high level of diligence and preventative measures. In Virginia, shipyards have implemented a common Safety Orientation. This provides all workers access to consistent resources that establish baseline expectations. This reduces costs by eliminating duplicate training, while helping to prevent misunderstandings when projects are performed by multiple companies on the same ship. The ability for an individual shipyard to singularly control their working environments is also complicated by having such a highly fluid workforce. Shipyard workers who have acquired a great deal of expertise over time may work at multiple facilities to accomplish complex jobs. This may cause challenges in the area of quality assurance. To address this issue, the companies collectively created a quality assurance audit program. The program allows all companies to utilize a common system of standards which eliminates the need for multiple audits and allows the yards to collectively monitor where improvements might be made. This audit program provides cost savings for everyone. The success of these two examples involved consistent commitment from dozens of companies. The following list outlines key elements identified by these companies that make such joint efforts more likely to succeed. 1. Find the point of synergy. This is the target identified that affects all companies equally without infringing on competitive advantage. Safety and quality mentioned above are examples of common core issues that impact every company in our industry. 2. Leadership. Everyone is invited to the table, but the largest and most relevant companies must believe that addressing a particular point of synergy has benefits for everyone and is worth an investment of their time and resources. 3. Neutral Facilitation. The administration and execution regarding the point of synergy should be facilitated by a neutral party. It is important that no one competitor thinks another one is driving the train to their own advantage. Even though some companies may benefit more than others, or the effort may be more strongly supported by some companies than others, the neutral party takes the role of keeping the focus on what is advantageous to the industry overall. In Virginia, the industry association may serve in this capacity, usually through a committee and staff liaison that gathers inputs to ensure everyone has the opportunity to contribute. 4. Recognition of differences. Inevitably, companies will at times reject part of a proposal because they have a different philosophy, practice or need. These are recognized, but the group continually goes back to keeping the focus on the synergy point and drives the group to a consensus on solutions that do not diminish business autonomy, but employs commonalities. 5. Key Ground Rule: Highest Standard. No matter what individual company practice or expectation exists, the standard for the project is to use the higher level practice to establish the common expectation. This often resolves issues that arise when recognizing differences. For example, some of yards have different safety requirements: While cloth safety shoes are acceptable under federal regulations, companies agree the leather option is better for shipyard environments and should be the one presented in the safety orientation. Although each individual company may enforce that standard differently, they all as agree it is the expectation to be taught. 6. Frequent meetings with minimal scheduling changes. Collaboration projects take a lot of attention, focus and man hours. Meeting often with consistency initially is imperative to maintain the flow of discussion and decisions. Always providing thorough notes on decisions and progress is important to keeping the group moving forward. As work progresses, meeting frequency may be reduced. 7. Implementation. There must always be a few companies that agree to be the first out of the gate in testing and implementing. This provides the opportunity to tweak any issues that arise, as well as to help with promotion and broad dissemination. 8. Quarterly or annual reviews must be established for the resolution of issues and keeping updates to maintain the integrity and quality of the initiative. Internationally, the shipbuilding and repair industry is continuously subject to increased economic pressures, material resource constraint and skilled workforce issues. A valuable resource would be for an appropriate organization to create a forum where points of synergy could be identified so collaboration efforts can be leveraged. William W. “Bill” Crow, President of the Virginia Ship Repair Association, is a retired 30 year Navy Surface Warfare Officer heavily involved in fleet maintenance. His last Navy Command assignment included extensive oversight of collaboration efforts regarding the consolidation of Navy-Army installations. Michelle L. Tomaszewski, Ph.D. has worked with VSRA for nine years developing new initiatives. She has 20 years of experience facilitating public-private partnerships in workforce and economic development for maritime and manufacturing industries.